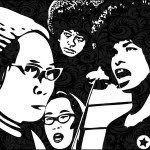 the [RETIRED] diary of a Prison Abolitionist: Angela Davis & Yuri Kochiyama: Well-behaved women seldom make history. Angela Davis & Yuri Kochiyama: Well-behaved women seldom make history. A Conversation on Life, Struggles and Liberation"
directed and produced by ASU professors Crystal Griffith and Helen Quan. Wednesday, January 20, 5 p.m. The FREE screening at 5 p.m. will be preceded by a reception at 4:30. A question-and-answer session with the filmmakers will follow the screening. The Tea Party Legislature now in Session. PHX Police shoot another suicidal man. ADC still eager to build those private prisons! FBI Watch: Calling Karen Sullivan. Prisoner Resistance: Muise on free speech.